When 10,000 people a day pass through your property, it has to look good. For a hospital, surroundings are even more important. A stay in the hospital can be a stressful experience. A hospital also welcomes new lives into the world and marks the start of recovery for many. Creating a healing environment is crucial. 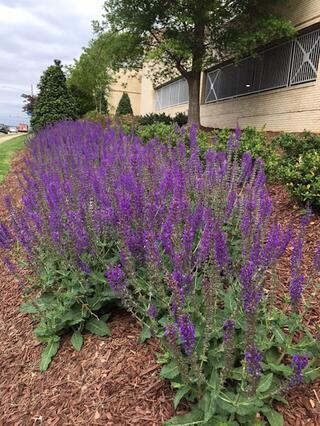 So the colorful flowers, green lawn and restful courtyards at WakeMed Health & Hospitals aren’t just beautiful — they’re healing. The nonprofit health care system founded and based in Raleigh, N.C. includes three full-service hospitals with 919 beds along with three Healthplexes, two Medical Parks and more than 50 physician office locations. WakeMed is the leading provider of health services in Wake County, employing more than 9000 people. WakeMed Raleigh Campus, the health system’s flagship facility located on New Bern Avenue, includes a Level I trauma center, a heart center, a dedicated children’s hospital and children's emergency department as well as a rehabilitation hospital. This campus alone has eight different entrances. First impressions are crucial, Stevens says. WakeMed Raleigh Campus opened its doors in 1961, and the years were starting to take a toll on its appeal, Stevens says. WakeMed hired Greenscape, Inc. in 2014 to manage landscape services for WakeMed Raleigh Campus. 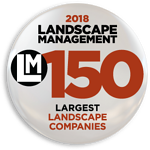 Then, in 2016, the system contracted with Greenscape to manage all 16 of their system facilities across the Triangle, from physician offices to corporate headquarters. While first impressions are important at WakeMed, so are lasting impressions, says Leslie Herndon, vice president of operations at Greenscape and the account manager for WakeMed. 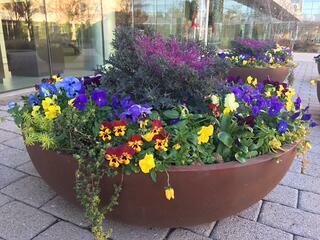 Greenscape added colorful flower beds at all the major entrances. 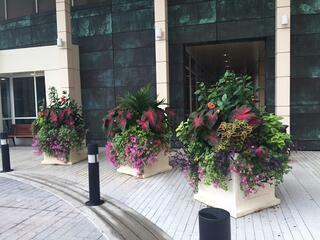 Large pots of intriguing plants and flowers — about 70 in all — add interest to entrances and several courtyards. Flowers change with the seasons, so they're always fresh and healthy. “Signage needs to be very visible here,” Herndon says. “People don't want to hunt around for the place they're going.” Bright flowers add extra visibility and appeal around signs. Crews removed old, outdated landscaping and did a complete renovation along the main entrance on New Bern Avenue. Meticulous landscape maintenance includes frequent blowing off of all entrance areas to keep them neat and free of debris. Restful, easily accessible courtyards are a highlight of WakeMed Raleigh Campus, and get a lot of use. Patients, visitors and employees dine outdoors. Rehab patients rest and recover. 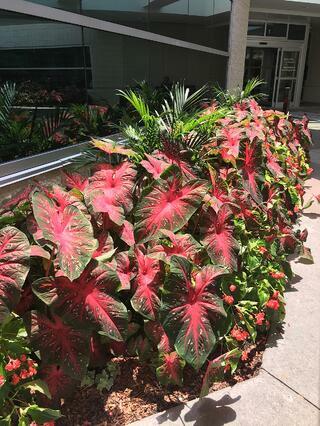 Families lounge on the cool grass and on benches and enjoy the pots of colorful lantana, coleus, caladium and angelonia. Employees pass through daily on the way in and out from the parking decks. May through September WakeMed hosts a weekly farmer’s market in the main outdoor courtyard, where patients and employees buy fresh peaches, broccoli and cherry tomatoes. Trees, shrubs and flowers create a cool, serene vibe, and one courtyard features a small waterfall. The high-use areas pose a challenge for Greenscape crews, who time their maintenance when the fewest number of visitors are there. At one location, a courtyard isn’t accessible from the outdoors. So Greenscape crews transport their mower and other equipment on a secure covered cart, wheeling it through hospital corridors and the elevator to access the courtyard. Greenscape crews are on site five days a week, so they know the property well. If visitors ask them for directions, they can assist. Crews keep branches trimmed, so visitors can easily navigate the property. They make sure flowers don't obscure signage. When pedestrians pass by, crews stop mowing or blowing until they’ve passed. All of this is common courtesy, Herndon says — and part of their job. “Timing is important, knowing when it’s OK for us to make noise and when we can't make noise,” Herndon says. WakeMed Raleigh Campus also includes a green roof on the canopy of its Main Visitor Entrance. Greenscape didn't install the 2,300 square foot feature, but it now falls under their care. Installed in 2009, the plant-covered roof is highly visible from patient rooms and hallways. But by 2016, Stevens says, it needed a boost. Herndon regularly attends the CitiesAlive Green Roof and Green Wall conference to stay informed about green roof care. Snow removal is a crucial part of the services Greenscape provides for WakeMed. Crews are on call 24/7, Herndon says, working double shifts during severe weather. Large truckloads of ice melt are applied to ensure nobody slips and falls. 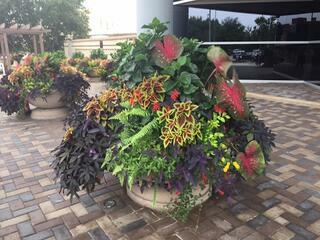 Before big storms move in, Greenscape crews arrive ahead of time and stay in a hotel a few blocks from WakeMed. “Our parking lots, driveways and sidewalks look better than the city streets,” Stevens says. There are two helipads on the property — one atop a third story building for the heart center, another on the ground for the emergency department. It’s crucial they stay clear of snow and ice. Another winter challenge: the hill that leads up to the emergency department. In past years, it’s become such a treacherous slick of ice that ambulances couldn't safely navigate to the drop off, Stevens says. “Greenscape keeps everything clear and safe for us,” he says. WakeMed is the lead sponsor of WakeMed’s PlayWELL Park at the Poe Center for Health Education in Raleigh. The innovative 1.5 acre health education playground teaches kids about health as they play, sliding through giant arteries in the physical activity treehouse, climbing a nutrition wall to learn about food choices, activating musical chimes as they monitor their pulse. Greenscape donates crew time to maintain the playground, from weekly mowing and landscape maintenance to spreading mulch. “We do it as part of our partnership with WakeMed and to further our vision of building and creating spaces where people live, work and play,” Herndon says. None of this happens without frequent communication. Herndon meets with Stevens in person every other week, as well as with property managers for the other WakeMed locations. She also has a project manager for the Raleigh Campus who's available for consultation as needed. “I want to keep making the property look better and better,” Stevens says. Beautifying the grounds takes a partnership, Stevens says.